Boat sized rubber sink plugs with a triangular sink chain ring. 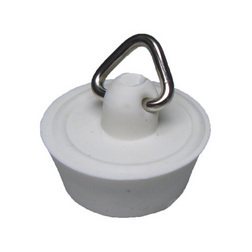 This sink plug is a boat sized rubber sink plug for sink waste drains found on boats and caravans. It has a triangular sink chain ring on the top so a chain can be attached to prevent loss of the plug.